Kieron Bryan, Anthony Perrett and Frank Hewetson of the UK were released on bail by a St. Petersburg court. A St. Petersburg court has ruled to release Arctic Sunrise activist Frank Hewetson of the United Kingdom on bail, Greenpeace said on Twitter on Thursday. Hewetson has become the third Arctic Sunrise detainee to be granted bail today. Arctic Sunrise cook Ruslan Yakushev of Ukraine and the vessel's mechanic Jonathan Beauchamp of New Zealand were granted bail earlier on Thursday. Courts in St. Petersburg are expected to hear bail cases of three more Greenpeace activists today. It was reported earlier that the Kalininsky and Primorsky district courts in St. Petersburg released 20 people on bail from the detained Arctic Sunrise vessel owned by Greenpeace. They are Marco Weber of Switzerland, Anthony Perrett of the United Kingdom, Kieron Bryan of the UK, Anne Mie of Denmark, Mannes Ubels of the Netherlands, Peter Willcox of the United States, Alexandra Harris of the UK, Faiza Oulahsen of the Netherlands, Sini Saarela of Finland, Francesco Pisanu of France, Paul Ruzycki of Canada, Camila Speziale of Argentina, Cristian D'Alessandro of Italy, Denis Sinyakov of Russia, Andrei Allakhverdov of Russia, Yekaterina Zaspa of Russia, David Haussmann of New Zealand, Ana Paula of Brazil, Miguel Perez Orzi of Argentina and Tomasz Dziemianczuk of Poland. A total of 23 Greenpeace activists have been released on bail so far. All of them were released on bail that was set at two million rubles each, which Greenpeace pledged to cover. The first four people, Zaspa, Paula, Sinyakov and Allakhverdov, have already left pre-trial detention centers in St. Petersburg. 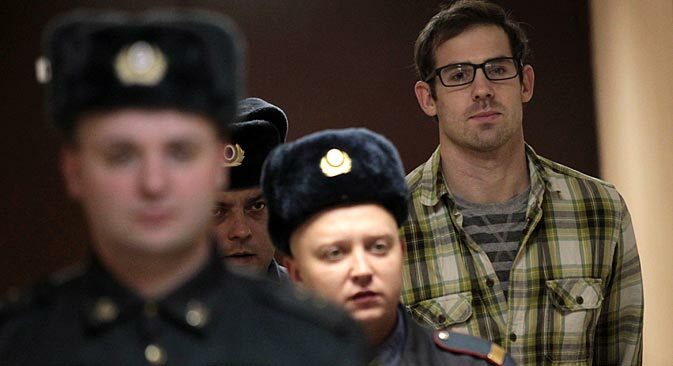 The Primorsky District Court, however, extended the detention of Colin Russell of Australia for three months. Thirty crewmembers of the Greenpeace vessel Arctic Sunrise were detained by Russian border guards in the Pechora Sea on September 19 while trying to hold a protest against the oil extraction activities on the Prirazlomnaya oilrig. The environmentalists were taken to Murmansk, where the Greenpeace activists were arrested for two months. The environmentalists were transferred to detention facilities in St. Petersburg on November 12.